The Allegheny County Department of Human Services’ Area Agency on Aging (AAA) is offering a free education series for caregivers of older adults. This series is for nonprofessional caregivers and is designed to help them gain an understanding of how to provide care for a loved one. The series will run once a month in May, June, July and August, at the AAA offices, 2100 Wharton Street, Pittsburgh, second floor. All sessions are from 10 a.m. to 12:30 p.m. Participants will receive information booklets on all topics covered. Registration is required and space is limited. Caregivers may sign up for one session or multiple sessions. 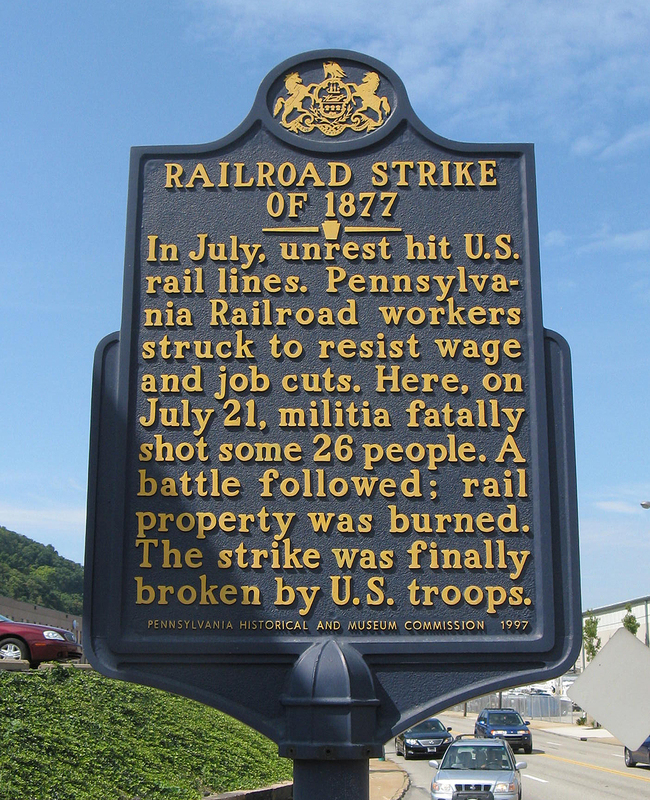 The Great Railroad Strike of 1877 was one of the most important events in labor history, spreading over ten states. 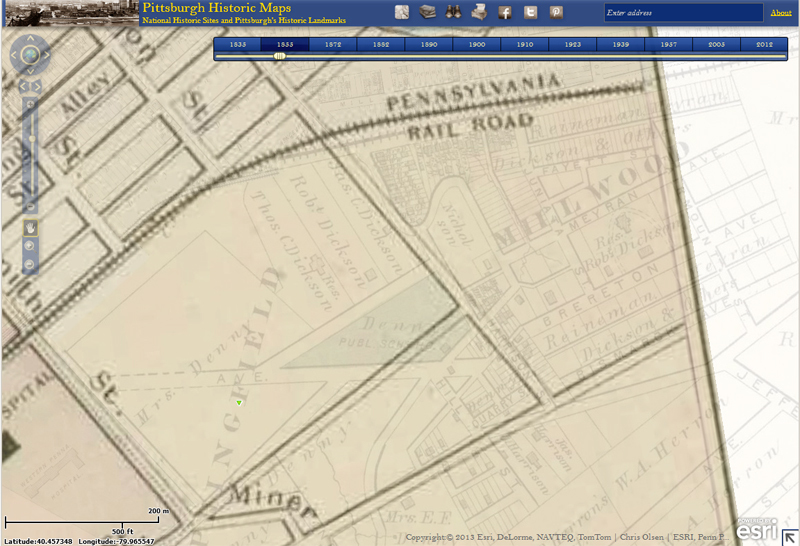 It was the first general strike in American history, and the biggest clashes of the strike occurred right here on July 21 and 22, on a site that now lies on the border between Polish Hill and the Strip District. 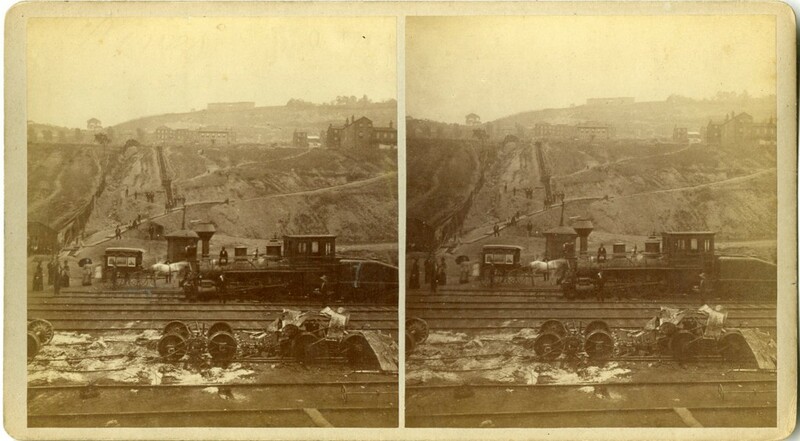 Once it was over, blocks of railroad property from around 33rd Street (now Herron Avenue) to 14th Street were destroyed. More than 40 people were dead and many more were wounded. 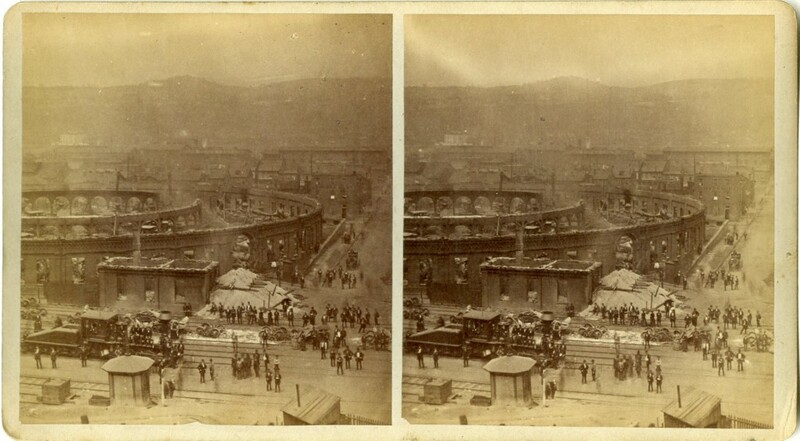 These stereoscopic views were taken by SV Albee in the aftermath of the strike. The image at the top of the post should look a bit familiar despite the lack of trees — it’s a view of 28th Street, looking south. The diagonal road visible on the hillside is Brereton Street, leading from 28th Street up to Stockholm Street and Kenney Way. Above: a view of the burned Roundhouse, from the hillside. In the distance is the North Side of Pittsburgh. 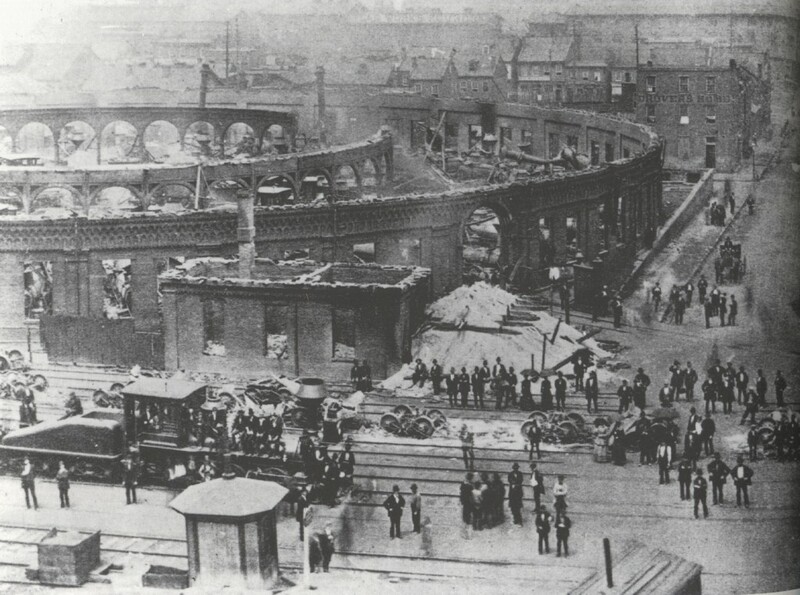 Another view of the burned Roundhouse. In the background are homes in the Strip District. The structure that was destroyed in the strike was replaced with another roundhouse which remained in service well into the 20th century. That structure is no longer standing, but its former location at 28th Street is still defined by the curve of the stone wall, which was built around it. The only marker of the event is a plaque at the small traffic island at 28th Street and Liberty Avenue. The plaque is difficult to see, and this piece of history deserves more. The PHCA is working with the City to create a park to commemorate the Great Railway Strike of 1877 and the events that occurred at the bottom of the hill. The proposed site for Roundhouse Park is on the north corner of Brereton and 30th Streets, on property owned by the Transit Authority. An update of the effort to create the park will appear in the next issue of the Polish Hill Voice newsletter, coming out in mid-August. A contemporary account of the strike from Harpers Weekly, August 11, 1877 (from The Catskill Archive). After reading this article, you’ll never look at Liberty Avenue the same way. A set of images from Explore PA History. 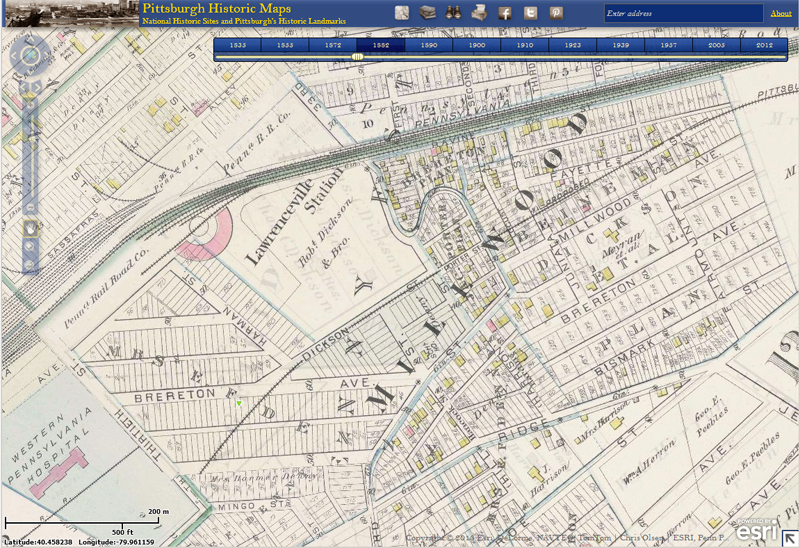 Here’s a really fascinating mapping website to check out: Pittsburgh Historic Maps is based on city maps of Pittsburgh, going back to 1833. (For more recent years, there are aerial photos.) 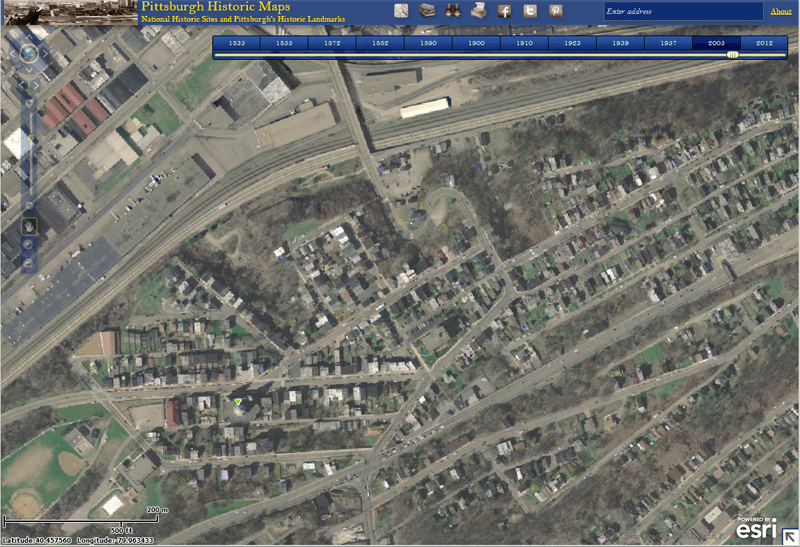 You can zoom in on any neighborhood, or part of a neighborhood. 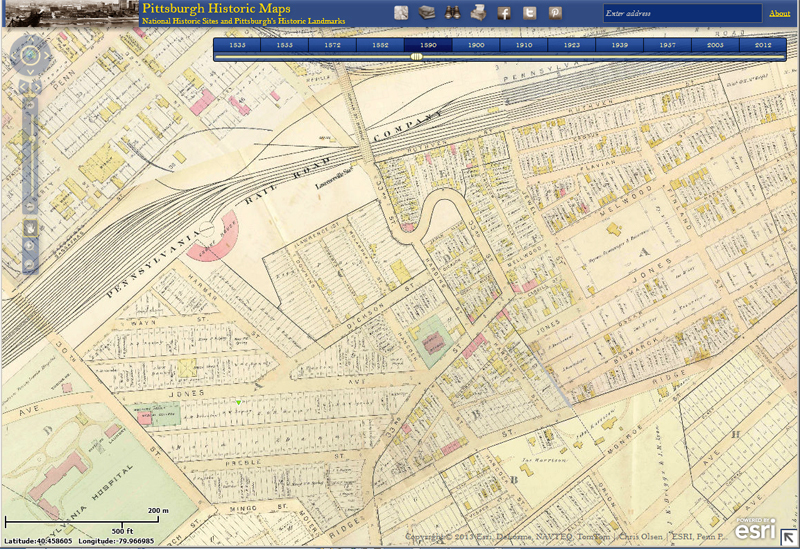 There’s a timeline with a little slider (visible in the top of the map image), which you can move to watch as the selected area changes over the decades. Street names change, houses and buildings appear, or disappear. And as the view fades from one map from the other, you can see both at once (as in the image below). You can look at any section of the city, but of course we wanted to look at our neighborhood. 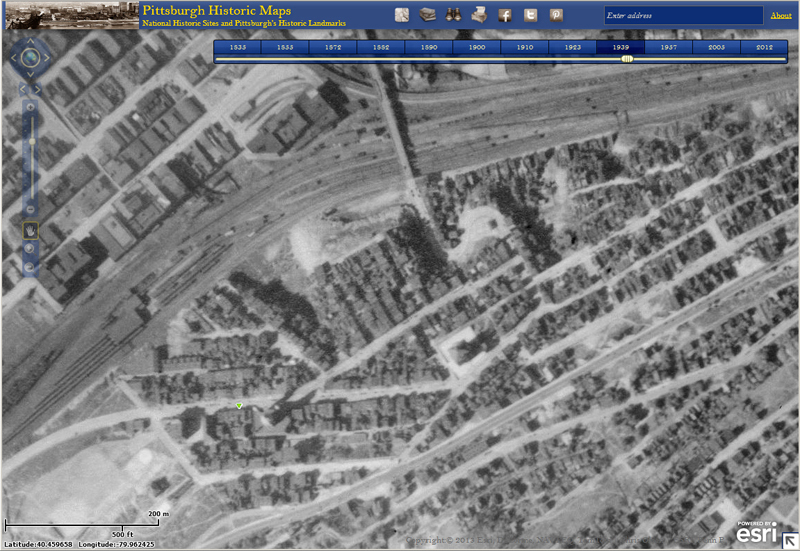 We zoomed in on the area that is now the central streets of Polish Hill. 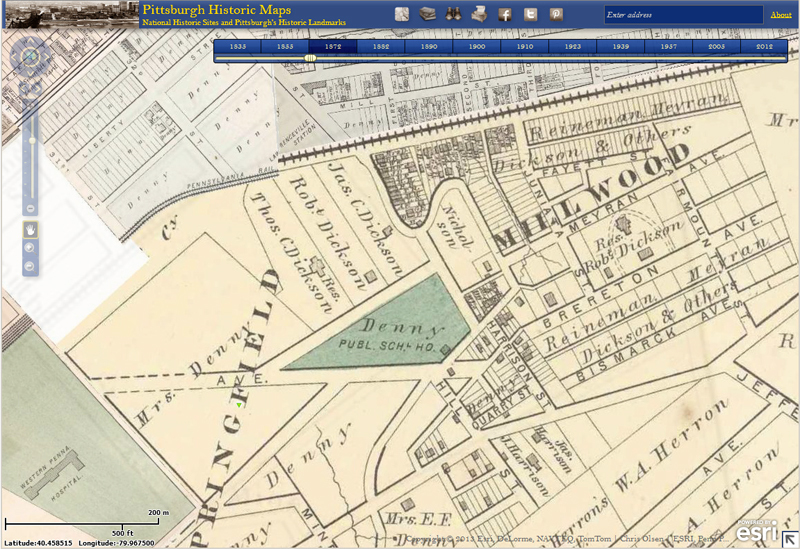 Below is a series of screen shots of the same section, from the mid 19th century to last year. 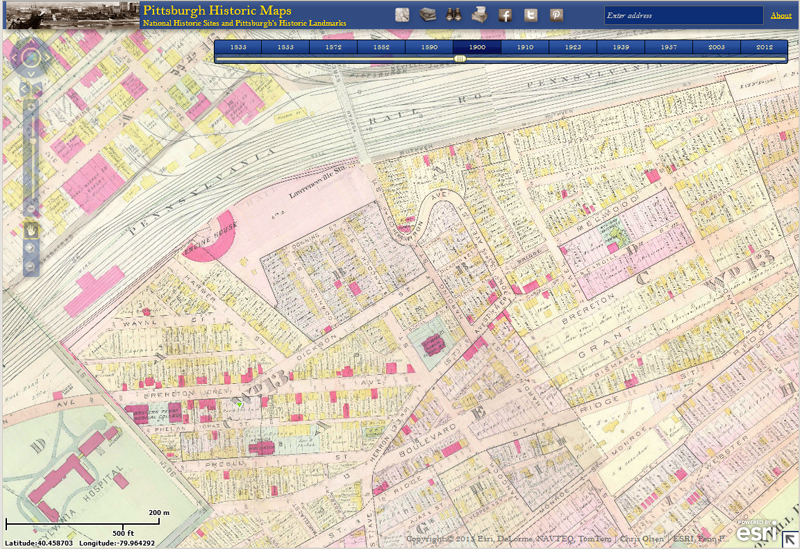 Again, the website is Pittsburgh Historic Maps. 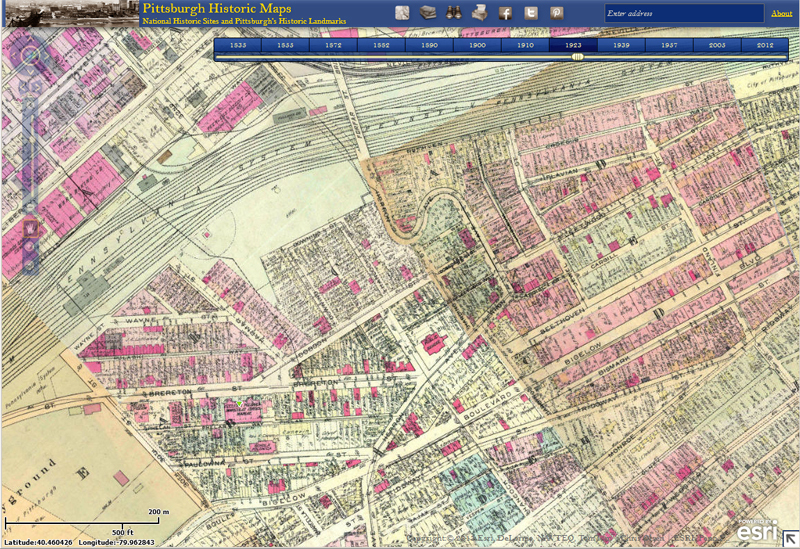 Check it out when you have some time to spare, because you’re likely to get absorbed looking at how the city has changed over time. Some events require registration. Click here for more details and a full schedule of all RADical Days events. You can also join the email alert list for RADical Days 2013 to get updates. To get text message alerts on your mobile device, text RAD to SMASH (76274); message and data rates may apply. You can also follow RAD and RADical Days announcements on Facebook. South Side––From River to Rail Explore South Side from a new perspective as we walk along 18th Street, from the Three Rivers Heritage Trail along the Monongahela River to the railroad tracks and the steps going up the South Side Slopes. Hear the story of how the Flats and Slopes developed. See the new housing development along the river and hear how South Side is balancing the needs of businesses and residents while working to keep this historic neighborhood vibrant. Meeting time & location: 1:45 p.m., 1720 South Shore Court, 15203 Tour guide: Karen Cahall (PHLF) and neighborhood representatives. From the long-awaited grocery store now under construction to the Thelma Lovette Family YMCA on Centre Avenue, improvements are in progress along Centre and Wylie avenues. Learn what else is in the works for this area of the city where so many immigrants once settled and where jazz greats and Pulitzer-prize winning playwright August Wilson found inspiration. Meeting time & location: 1:45 p.m., Freedom Corner (91 Crawford Street, 15219) Tour guides: Karen Cahall (PHLF) and neighborhood representatives. Each tour is limited to 25 participants. Reservations required. Contact: Mary Lu Denny(412-471-5808, ext. 527). Click here for the full schedule of tours this fall. Like used book sales? Here's a good one. The Calvary Episcopal Church in Shadyside is holding their annual used book sale this weekend, and if you love reading — and getting great books for not a lot of money — you should definitely try to make it over there. They have rooms of books — bestsellers, bibles, cookbooks, hardcovers, nonfiction, novels, paperbacks, as well as DVDs, CDs, video and audio tapes, and vinyl records. They get an amazing variety of really cool stuff, and the prices are great. The sale is from 10:00 a.m. to 2:00 p.m. on Saturday, and from 10:00 a.m. to 1:00 p.m. on Sunday. Calvary Episcopal Church is at 315 Shady Avenue at Walnut Street, and their phone number is 412.661.0120. On Monday, June 10 at 6:00 p.m., the Design Center of Pittsburgh presents Behind the Magic of Urban Alchemy: Stories of Urban Restoration in Action, a presentation by Mindy Fullilove and French urbanist Michel Cantal-Dupart. Also speaking will be Dan Rothschild, Molly Kaufmann, Terri Baltimore, and Ken Doyno. The presentation will be in the Hillman Auditorium at the Kaufmann Center at 1835 Center Avenue in the Hill District. PHCA staff and board members recently attended a talk by Dr. Fullilove at the Community Development Summit, and came away energized and excited by her ideas. Dr. Fullilove is a great speaker with some very inspiring things to say about community. In her new book Urban Alchemy, Dr. Mindy Fullilove presents a psychiatrist’s views on how to fix the American city. She identifies nine elements of urban restoration that are critical tools for repairing our cities and restoring the nation’s neighborhoods to health. The nine elements are illustrated by stores of connecting communities, “re-discovering home”, celebrating differences, strengthening solidarity, and creating more livable and meaningful places — shared by the people who are on the ground and make it happen every day. If you’re interested in issues of urban restoration and community building, we highly recommend this presentation. Admission is free, but an RSVP is requested. For more information or to RSVP, contact abekeny@designcenterpgh.org, or call 412.391.4144. 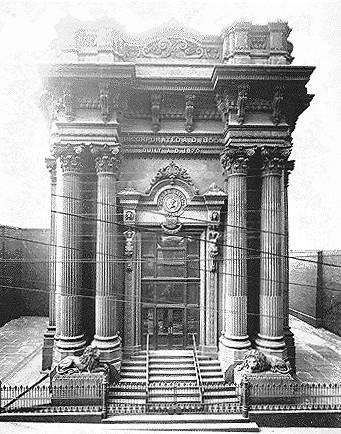 An article in the Post-Gazette today told of the famous sculptures of stone lions that stood outside Dollar Bank on Fourth Avenue for 138 years. Eroded from years of pollution, the lions were removed for conservation and returned to a spot of honor inside the bank. New stone lions were sculpted and installed at a ceremony yesterday morning. 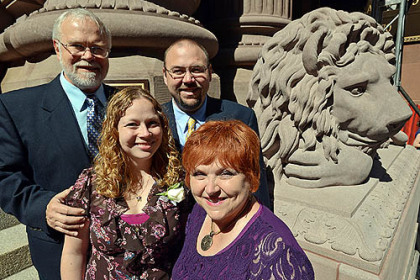 A German immigrant stone mason, Max Kohler, carved the original lions on site in 1871. 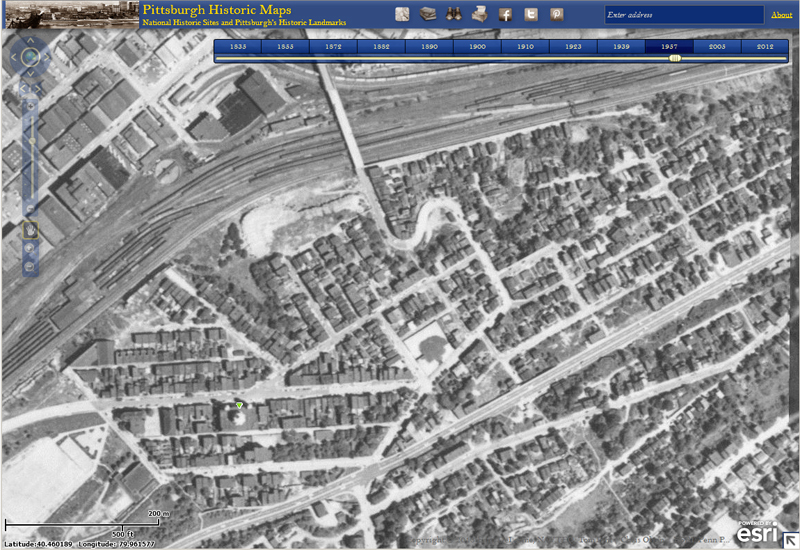 Max Kohler lived on Herron Avenue, in what is now Polish Hill, for most of his life. He had eleven children with his wife Celestena. Some of their descendents were present at the ceremony on Wednesday morning. 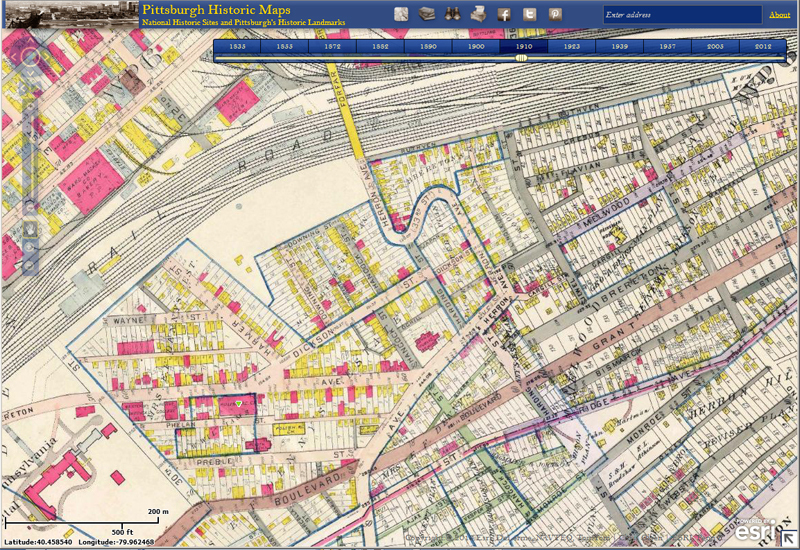 To find out about a long-ago resident and to get a little glimpse into Pittsburgh history, read the Post-Gazette article. Pittsburgh Public Schools has an urgency to think differently about how it delivers a 21st Century education to all students – especially during a time when revenues are flat and expenditures are increasing. The District faces the challenge of closing a $50MM budget shortfall while ensuring that the structures are in place to support its vision that 80% of Pittsburgh Public Schools students earn a post-secondary degree or workforce certification. In January 2013, the District embarked on a large scale visioning process called Envisioning Education Excellence: A Plan for All of Pittsburgh’s Students to address the current state challenges and future goals of the District. Continued engagement of students, teachers, principals, funders, and the broader community is critical to the success of this project. In an effort to incorporate the community’s feedback on Pittsburgh Public Schools into the Envisioning work, we’d like for you to take this short survey. It should take ~10 minutes to complete and your responses will remain anonymous. Your input will be used internally to assist in future decision making and evaluate proposed actions for the District. All are encouraged to respond- not just those with children being served in the Pittsburgh Public Schools. You can find the link to the survey here: Pittsburgh Public Schools Online Survey. It will be open until Friday, June 7th. Please forward this message along to your networks so that others can take the survey. If you want to learn more about the work we are doing, please visit our website: Envisioning Educational Excellence. You may also feel free to email envisioning@pghboe.net with any questions.